Nearly 200 000 light-years from Earth, the Large Magellanic Cloud, a satellite galaxy of the Milky Way, floats in space, in a long and slow dance around our galaxy. Vast clouds of gas within it slowly collapse to form new stars. In turn, these light up the gas clouds in a riot of colors, visible in this image from the NASA/ESA Hubble Space Telescope released Jan. 17, 2013. 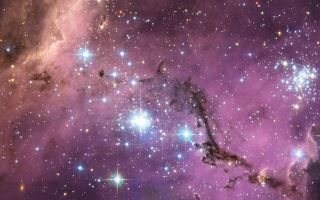 Nearly 200 000 light-years from Earth, the Large Magellanic Cloud, a satellite galaxy of the Milky Way, floats in space, in a long and slow dance around our galaxy in this stunning space wallpaper. Vast clouds of gas within it slowly collapse to form new stars. In turn, these light up the gas clouds in a riot of colors, visible in this image from the NASA/ESA Hubble Space Telescope released Jan. 17, 2013. The Large Magellanic Cloud (LMC) is ablaze with star-forming regions. From the Tarantula Nebula, the brightest stellar nursery in our cosmic neighbourhood, to LHA 120-N 11, part of which is featured in this Hubble image, the small and irregular galaxy is scattered with glowing nebulae, the most noticeable sign that new stars are being born.